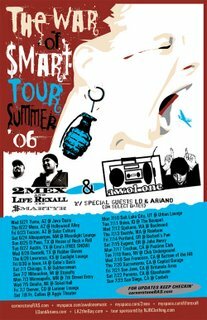 Free show at Emo's Lounge on June 27th with Awol One, 2Mex & Life Rexall ( $Martyr ) and LD & Ariano ( Technicali )! So I've added a Google groups mailing list... you can see it on the sidebar... please join and let's see if we can spark up some good conversations! Bursting on the scene from Planet Zero, California, Awolrus' style has taken him through the murky waters of hip-hop. In 1988, AWOL took off on his b-boy journeys influenced by KDAY and breakdance music. Soon after, vinyl became no stranger and the art of DJing lived in his knuckles. 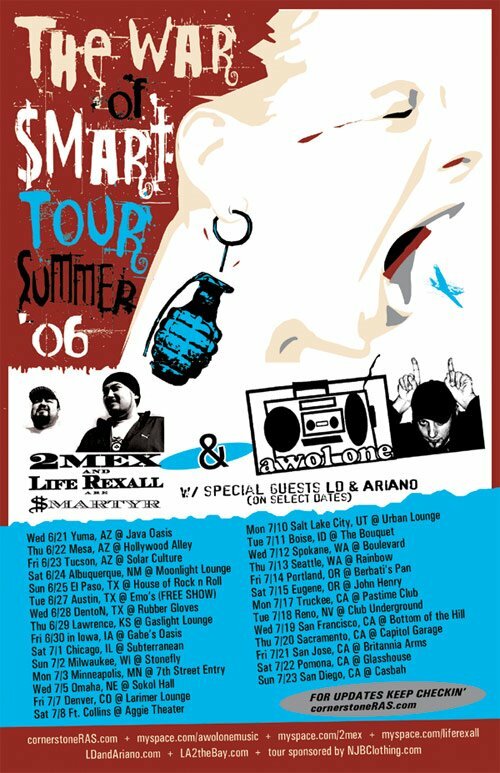 AWOL found himself DJing in underground parties, eventually moved up to night clubs, and then "Lowrider Magazine" American Tour for Thump Records in 1995 opening for Roger and ZAPP. Another aspect of AWOL's art is graffiti -- and even with unjust laws striking him in 1991 -- he still paints and does graphic design.